I’m never sure whether to call Ted Leeson the thinking fly fisher’s writer or the thinking man’s fly fisher. I don’t suppose it matters, since he qualifies as both. 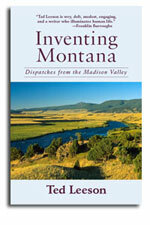 His brand new book Inventing Montana (Skyhorse Publishing, August 2009, 233 pages, hardcover) only moves him further up the list of authors who see fly fishing from inside out and outside in at the same time. I’ve read the book twice now, and I hope to get back to it once more when the temps drop to five degrees and the mind grows sluggish. It might be even better then. Read Leeson’s chapter on flies and their fishers and I guarantee you will never look at fly selection the same way. This week we’re happy to share a short excerpt from that chapter, “Patterns of Behavior,” on MidCurrent.